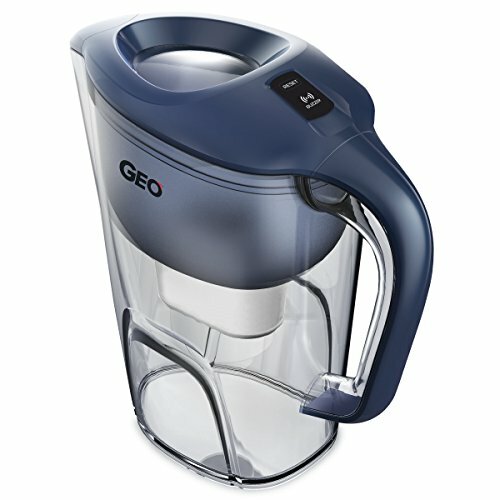 The Everyday Pitcher-Geo's largest basic pitcher - holds enough water for the whole family to enjoy. The BPA-free filter reduces chlorine taste and odor, zinc, copper, mercury and cadmium, often found in tap water. The classic oval design fits easily into most refrigerator doors. The Brita Everyday Pitcher gives you significant savings over buying bottled water and can help keep up to 300 disposable plastic bottles out of our landfills each year. Keep great-tasting filtered water flowing by replacing your filter every 40 gallons or approximately every two months. Substances reduced may not be in all users water. This GEO product is BPA FREE, made of only the highest quality Tritan Resin in the USA. Through well-known testing and experiments, science has proved that the production of Tritan is 100% unassociated with and 100% free of all Bisphenol compounds including BPA and BPS, making your health our priority. The pitcher features a GEO filtration system, eliminating harmful contaminants that deter health. Filters through chlorine, copper, mercury, cadmium and other impurities, leaving you with safe, pure-tasting, odor-free water. Heavy-duty, durable plastics guarantee the product lasts through daily use and a filter status indicator leaves you worry free, letting you know when it's time to change the filter and keeping your water pure at all times. Note: Filter change recommended every 40 gallons, approx. 2 months for the avg. household. FDA approved, food-grade plastics, ensure you can drink worry free from a sustainable, reusable pitcher that can fulfill your quench anytime, anywhere. If you have any questions about this product by Geo Sports Bottles, contact us by completing and submitting the form below. If you are looking for a specif part number, please include it with your message.